The 'green-living' Toyota Prius has become the ultimate statement for those seeking to stress their commitment to the environment. However, the environment-saving credentials of the cars are seriously undermined by the disclosure that one of the car's essential components is produced at a factory that has created devastation likened to the arid environment of the moon. So many plants and trees around the factory at Sudbury in Ontario, Canada, have died that astronauts from Nasa practised driving moon buggies on the outskirts of the city because it was considered the closest thing on earth to the rocky lunar landscape. Unlike normal cars, hybrids such as the Prius, whose proud owners include Gwyneth Paltrow, Brad Pitt, Julia Roberts and ex-Tory leader Michael Howard, are powered by a battery that contains nickel - as well as a traditional petrol engine. Toyota gets the metal from a Canadian company whose smelting facility at Sudbury has spewed sulphur dioxide into the air for more than a century. The car giant buys about 1,000 tons a year from the plant, which is owned by Inco, one of the world's largest nickel-mining companies. Fumes emerging from the factory are so poisonous that they have destroyed vegetation in the surrounding countryside, turning the once-beautiful landscape into the bare, rocky terrain astronauts might expect to find in outer space. Although efforts have been made in recent years to reduce emissions from the plant's 1,250ft chimney - dubbed the Superstack - campaigners say the factory is still respon-sible for some of the worst pollution in North America. David Martin, energy co-ordinator of Greenpeace Canada, said: "The acid rain around Sudbury was so bad it destroyed all the plants and the soil slid down off the hillside. "The solution they came up with was the Superstack. The idea was to dilute the pollution, but all it did was spread the fallout right across northern Ontario. Things improved in the Nineties but the plant is still responsible for large-scale emissions of sulphur dioxide. 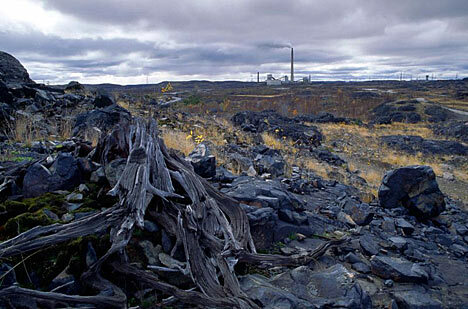 "Sudbury remains a major environmental and health problem. The environmental cost of producing that car battery is pretty high." Once the nickel is smelted it is sent 10,000 miles on a container ship journey which in itself consumes vast quantities of fuel and energy. First it is shipped to Europe's biggest nickel refinery at Clydach near Swansea, South Wales. From there it is transported to the Chinese cities of Dalian and Shenyang to be turned into a lightweight substance called nickel foam. The final stage of the manufacturing process takes place in Japan where the Prius batteries are made. Toyota produced nearly 180,000 Prius cars last year, some 4,000 of which were sold in Britain. Last week 14 MPs from all parties claimed they had exchanged their petrol-guzzling vehicles for a Prius or similar hybrid. But some experts doubt whether the Prius even wins the argument over fuel consumption. Robert Fowler, of the Battery Vehicle Association, said: "It is questionable whether it does any more miles to the gallon than a good diesel. "The hybrid system has a very small battery so most of the time it's operating as a petrol car, particularly out of town and above 30mph." A Toyota spokesman said last night: "I cannot confirm the source of the nickel used in the Prius battery. It is true there is a slight increase in the energy required to produce the materials for the car." Your thoughts? Maybe "green" isn't so green after all..
- Toyota is not a primary customer of this factory - 1,000 tons of nickel is far too little to keep it in business. That Inco plant produced 267,500 tons of nickel in 2006. - The 1,000 tons of nickel is not dedicated to the Prius, but Toyota. Tundra probably uses more nickel. - The plant is not owned by Toyota or joined at the hip. This starter thread seems like a toxic introduction. Last edited by Delta Flyer; 01-23-2007 at 06:17 PM. "Toyota gets the metal from a Canadian company whose smelting facility at Sudbury has spewed sulphur dioxide into the air for more than a century"
In short, the premise of the article is false. There is more nickel in stainless steel than hybrid electrics. There's a new member here, fastNX, I think, from the Nissan forum who, if I remember correctly, somewhere in that forum states that he lives around the area, and the environmental picture depicted in that article is from the 70s or 80s and that the area is much cleaner since that plant cleaned up there act. If he's correct, then the article is majorly biased against hybrids, since 70s-80s there were no hybrids. If this is correct, we need someone to verify this, since the implication in that article is way out of line. It doesnt state that because of the need for nickel in hybrids that caused the devastation and pollution, but it tries to make you to think that. I dont know, but it seems that way to me. if you dig a little deeper you will see the destruction was done by a company that toyota is a customer of, Not by toyota. Hmmm... The Prius has been around since 1997 (and even then in only minute quantity). But the factory has been around for over a hundred years. Yup! It's a hybrid-hate article! The thread title and the poster's number of posts says it all: Troll nearby, watchout! Uh, "0" is not "exept the computer". You've contradicted yourself. We get 52 MPG and they don't even test the Prius for emissions in my state. That saves us a bundle. And then you typed in this illiterate note and took it all back. When Chevy and Dodge sell cars that get Prius mileage at a Prius price, I'll consider one. I just can't afford to pay 'chevy and dodge' gas bills. No, just my gas money. In another week or so, I'll have to buy some gas. So you have a 'mustang' and a 'truck,' good. We also have two vehicles, both Prius. Just be careful when spitting, you don't want to lose any more brains. 1986 Mustang V8's don't get anywhere near 25 mpg in the city. That 5.0 liter motor was infamous for bad fuel efficiency. They might get 18 mpg on the highway, and 14 in the city, if the driver is specially trained to maximize fuel economy.